Nowadays, it’s incredibly difficult to be unique in the scene of street art. One of the rare individuals who manages to do so is Nikola Mihajlović, a Serbian urban interventionist who devised a special way of achieving originality. This Belgrade-based author explores his inner self before transforming what he finds into abstract compositions. Some of his artworks do have figuration to some extent, but Nikola’s main vocabulary heavily relies on abstract concepts and visuals. Another important aspect of his work is creating a harmony between his pieces and the urban surroundings, synchronizing them with the local architecture, culture, and nature of the location. For as far back as he can remember, Nikola was always drawing something. All he would need is a scrap of paper and a pencil in order to make the world his playground. When he was still a toddler, Mihajlović actually imagined himself being a painter when he grows up. While still at a very young age, Nikola discovered the realm of graffiti which stroke him as something incredibly attractive and fascinating. It basically had everything a kid would want – a rebellious spirit, the sense of freedom, individuality, colorful letters and characters. 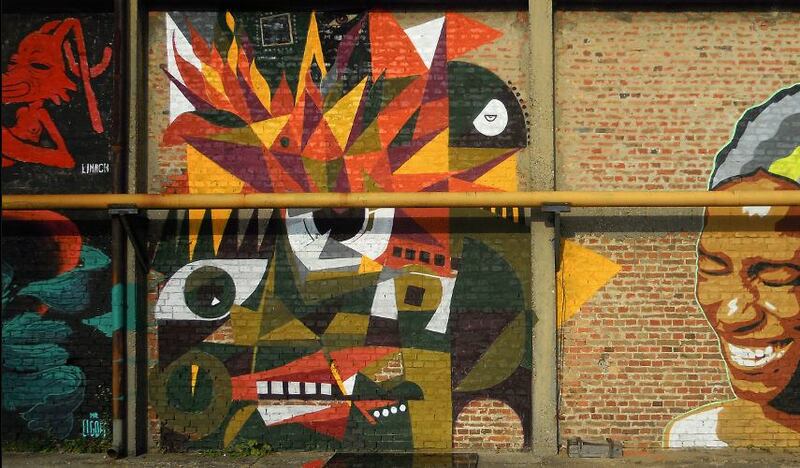 Swallowed by this limitless world, Mihajlović fell in love with street art. Since he was not in a financial situation to afford as many spray cans as he needed, a staggering number of his compositions ended up in his notebook instead onto a wall. 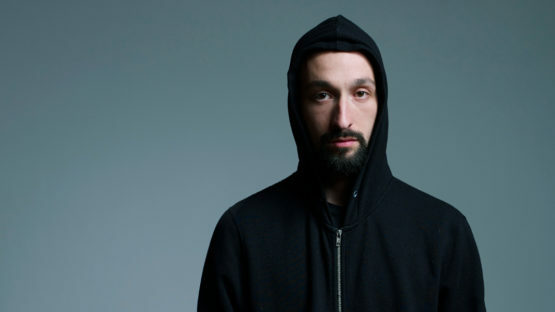 During his high school years, Nikola focused on other things than urban interventions, although many professors supported his creative tendencies. However, after he started attending classes of the architectural studies, he regained his interests in art-making practices and decided to try and become a full-time artist in order to discover his inner self. Since going through his own personal creative Renaissance during the college days, Nikola Mihajlović was active both on the walls and in his studio where he mostly experimented with different materials and approaches. Most of the outside influences that had an effect on his art were teachers, both those from Nikola’s high school and the Architectural faculty. By listening what they had to say, Mihajlović discovered many new artistic grounds, introducing himself to various forms, shapes, compositions, and techniques. All of these are quite obvious in Nikola’s street artworks as they too possess a rather obvious openness to experiment and take risks. This eventually developed into an abstract vocabulary Nikola began sharing with the streets of Belgrade. By pursuing abstraction in his own work, Mihajlović discovered the art of Kazimir Malevich, a Russian pioneer of geometric abstract art and Nikola’s artistic idol. This Russian’s art and complex ideas of existence, reality, consciousness and emotions are an infinite source of inspiration for Nikola. As was said above, the street art gig is one of those activities which truly challenges anyone that desires to be completely original. Whatever one conjures, it’s likely that someone else already did it first, whether in the terms of the theme, composition, technique or medium. In order to stand out, Nikola devised an approach that requested him to dig deep into his subconsciousness, seeking for personal expression that needed to be brought out to the surface. This process in probably best explained by the street artist himself: Complexity of the inner self-takes simple forms on the surface, organizing the chaos that occurs inside someone’s mind. I embraced the urge to simplify my inner being and started using simplification method in the pursuit of awareness, exploring both myself and the surrounding reality. That kind of abstract thinking leads you towards the essence of existence and hidden truths. 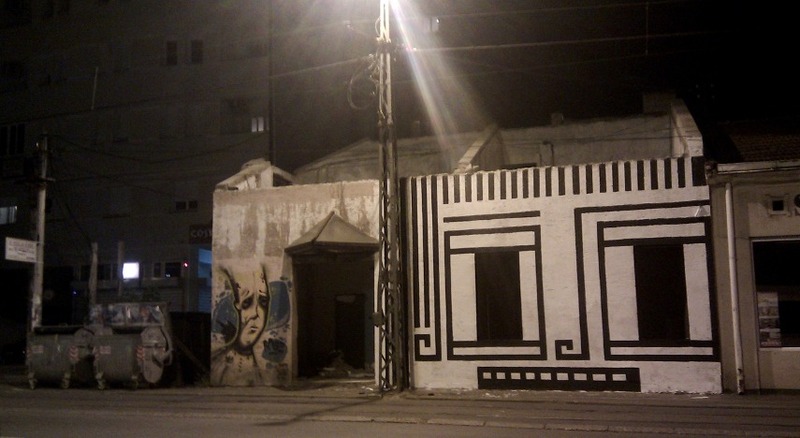 This is the inspiration of Nikola’s street artworks which are dedicated to breaking the code of the visible, material world. Before starting an urban intervention, Mihajlović first gets in contact with the surrounding architecture, nature, people and culture. All of that will be a crucial element in the mural to come. Ever since he was a child, Mihajlović was toying with the ideas which bombarded him constantly. As a result, his current visual vocabulary is a product of constant experimentation and innovations. This, of course, led to many radical changes of his style over the years. His initial phase lasted until the year of 2013 and was marked by simple forms and the absence of colors. During that period, he usually depicted large, black and white heads and faces. This period was also marked by Nikola’s strong tendencies towards mathematics as he observed all elements of his work through the prism of various mathematical rules – a feature which was definitely fully established as Mihajlović was learning to become an architect. 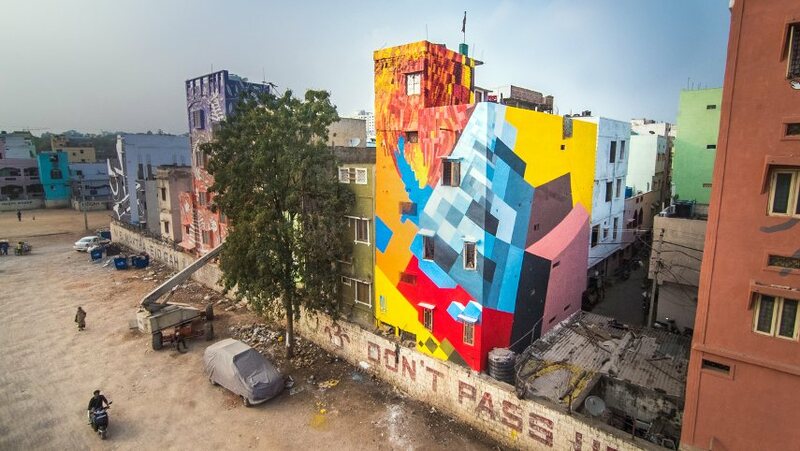 Nikola’s second act of street art making was primarily marked by the introduction of colors. This changed his work dramatically as he became less rigid and square-shaped. In other words, colors liberated Mihajlović’s style from its stern bonds and allowed him to establish his unique concepts of self-exploration. This also enabled him to play with the perception of viewers, forcing them to think outside the box. As it was explained above, Nikola Mihajlović seeks to investigate the universe beyond our space, time and dimension, searching for answers by digging deep into his own mindset. Judging by that concept alone, this author already separates himself from the majority of his street colleagues, introducing one of the most unorthodox concepts the urban interventions have ever seen. Luckily, the audience is taken along this artistic journey Nikola orchestrated and, by doing so, setting themselves in a position to observe the world around them from a slightly different perspective. This kind of provocative toying with the people’s perceptions is just another one of Mihajlović’s unique features which set him apart not only within the borders of Belgrade and Serbia but much, much broader than that. Nikola Mihajlović lives and works in Belgrade, Serbia.